Have you ever had a craving so strong that you start to obsess about it? At first you think just a little about it, and then you think about it more and more, until you’re basically useless because you aren’t getting anything done, all you're thinking about is the craving. Yeah… so call me a little crazy, but I’ve had that building for the last couple of weeks - all over McDonald’s French fries! It’s not like I profess to never go to McDonald’s or anything. In fact, sometimes the drive thru people know me. But I tend to get a coffee, or lately a large unsweetened iced tea. Sometimes I run through and grab a happy meal for “L”. Yes, I allow my child to eat a happy meal every once in awhile, and as he puts it “Mommy, it’s not a sad meal. You know why? Because it has a toy!” Thank you marketing geniuses at the golden arches, you speak right to the sensibilities of a four year old! 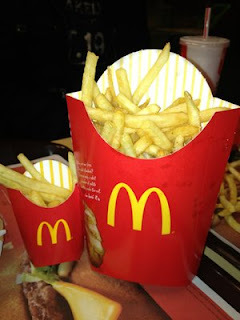 Speaking of the Happy Meal, have you seen what they’ve done with the size of the fries? I’m pretty sure it was this altering of the universe that led to my craving as of late. The fries are mini… super tiny! Happy Meal sized fries next to a large fry! And now the meal comes with apples AND fries – think little itty bitty. Of course, my child is ecstatic with the changes because he actually LIKES the apples … who knew? I know I'm taking this hard, but you get the picture. I used to steal a few of those fries, and now there aren’t any extra to steal. My inability to “steal” a French fry in the last few months led to me obsessively thinking about them – imagining how they would taste, the initial crunch and then the soft potatoey inside. If you follow me on facebook or twitter, you’ll know the pinnacle of my craving was Tuesday. It was intense, and I started searching for a replacement, but knew that a replacement wouldn’t do. So I looked up the PointsPlus value of a medium McDonald’s fry – 10 PointsPlus. OK, so now I know. Tuesday I drove my car to McDonald's, walked in the door and ordered that medium French fry. I dipped the first fry in and ate it – pure bliss! Yes, it seriously did taste as good as I had expected it to in my head for the last couple of weeks. I slowly and deliberately enjoyed every last fry in the container, and swiftly left the premises – my craving satisfied! We're often taught in Weight Watchers that when we're craving something to ask ourselves what we really want – happiness, comfort, love? A respite from stress, perhaps? Yes, often cravings are us looking for some emotional void to be filled. But sometimes, cravings are just that… CRAVINGS! I asked myself what I really wanted… I wanted fresh, super hot McDonald’s French fries! I assessed the risk… If I eat the fries, I’ll have to give up 10 of my daily or weekly points, plus points for the amount of mayo I intend on eating. I planned my attack… I ordered fries “without salt” so I could guarantee they would be fresh and worth eating. I indulged my craving… I sat and deliberately enjoyed each and every last fry. I moved on…I immediately tracked the points in my journal and “ate smart” for the rest of the day. I lost 116 pounds because I learned that life is about balance and cravings (and sometimes French Fries - at least mine is), and I'm losing these last 20 or so pregnancy pounds using the same tactics. I don’t have one bit of guilt about eating those fries, and my craving is now 100% gone. Mission... Accomplished! I think it's okay to give into a craving if you have ridden it out for a while. Having a little and not binging is good! Unless there is an AWESOME toy for something my boys love, I avoid it McD's. I swear-one of the boys always gets major tummy issues after eating there. I tend to crave ice cream pretty much any time of the year. Skinny cow has some great products and I love that they are already portioned out for me. Cute site! Just found you! I'm a new follower. Your daughter is adorable and keep up the good work! I am a WW drop in drop out. and I totalllllly understand using your points for what you really want. Sometimes your body just needs some fries!